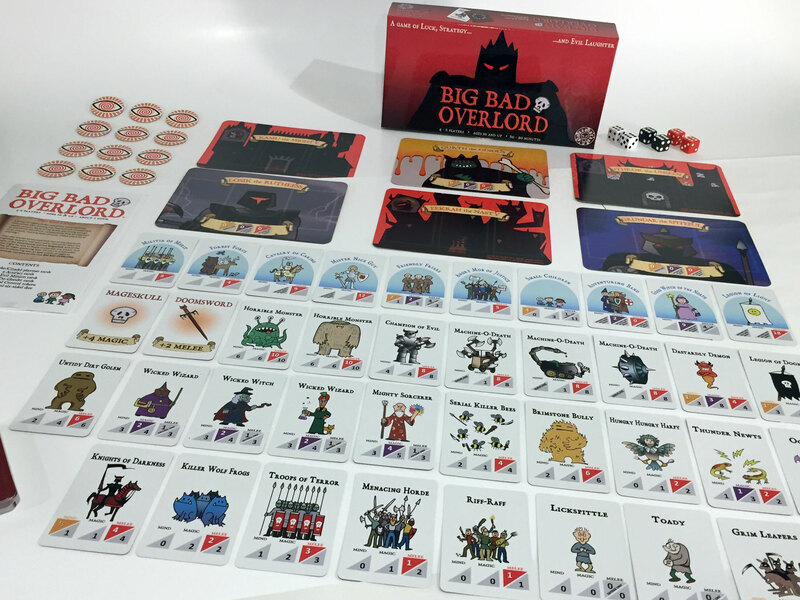 The game comes with 74 evil Minion cards, featuring 29 different designs and troop types, to add to your armies; 10 unique Do-Gooder cards, featuring misguided foes in need of squashing; 6 unique Citadel playmats, each with a portrait of a different Duke on the reverse; 2 Magic Artifact cards; 6 six-sided dice (white, red, and black); 12 Mind tokens, to mark cards captured by Mind Control; and a 16-page illustrated instruction manual, including sample battles. The box is around 10.5 by 5 by 2 inches - large enough to contain all your evil mayhem, but small enough to bring with you when you wish to visit mayhem on your friends. Thanks to all of our backers for successfully funding this game on Kickstarter! Production is underway and we expect to have the game available by no later than September 2019. If you have any questions, contact us!